Worcester, MA, June 05, 2018 –(PR.com)– As companies increasingly face the challenge of how to connect diverse audiences with brands across every touch point, consolidated creative groups with complementary visions, extensive resources and cultural synergies are providing the solution. Award-winning trade show exhibit firm, BlueHive Exhibits, announces that it will be centralizing its three service lines under a new entity, the BlueHive Group. Each of the component companies, BlueHive Exhibits, Paris Marketing and Continental Woodcraft, will retain their identities within the new structure and will continue operations at the Group’s headquarters. The decision to consolidate the services was a proactive response in recognition of the increasing pressure that companies face in connecting audiences with their brands in the most complete way possible. A recent study on digital marketing trends reported that by 2020, customer experience is going to overtake price and product as the key brand differentiator. The majority of companies surveyed also reported that they plan to invest nearly a quarter of their marketing budgets in developing more holistic, end-to-end customer experiences. In the BlueHive Group, professionals can now gain access to complete marketing, event, and architectural millwork solutions that can help them accurately measure the value of their spend in a single, collaborative space. While the concept had been in the works for the past 18 months, the decision to move forward was greatly influenced by the acquisition of Paris Marketing in the fall of 2017. The model also allows for growth and further strategic acquisitions. Prior to the merger with Paris Marketing, Hanlon had acquired artisan custom millwork firm, Continental Woodcraft in May 2009. As with Paris, Hanlon identified that Continental would complement the company’s trade show capabilities. Three companies under one roof. From show-stopping exhibit designs and digital marketing campaigns, to custom-branded office environments, the BlueHive Group helps key audiences experience brands by connecting them in the most complete ways possible. 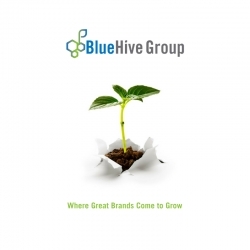 The BlueHive Group: Where Great Brands Come to Grow. The BlueHive Group is home to three individual companies working together with a singular purpose: to help our clients thrive. Our dynamic approach to marketing brings tradeshow design and build, full-service marketing, and architectural millwork all under one roof. This not only provides brands with consistency at every stage in the process, but also allows companies to maximize the effect of their messaging by impacting key audiences in every possible way.